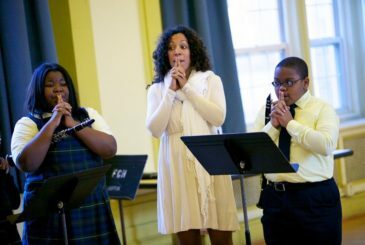 Having grown over the past few decades, PCMS’ Education Program has evolved to serve audiences of all ages. Amassing nearly the same number of events as our main concert series, it supports our mission of bringing great music to all people in Philadelphia and fostering community around the shared experience. No matter their experience or entry-point to chamber music—a child’s first exposure, a student’s one-on-one interaction with an artist, or the impact on a long-time patron—each facet of our Program seeks to inspire all people, building classical music audiences now and for the future. We are grateful for the support we receive through the Lois and Julian Brodsky Music Education Fund; the Paul M. Angell Family Foundation; the Cassett, Connelly, Dolfinger-McMahon, and Presser Foundations; the Hirsig Family Fund; and countless donors. 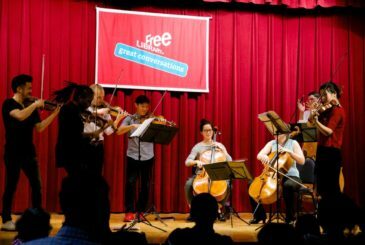 Free children’s concerts introduce the next generation to chamber music through our partnership with the Free Library of Philadelphia. 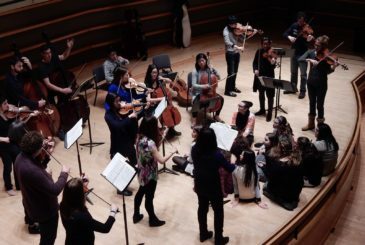 ECCO, Time for Three, the Dalí String Quartet, and the Chestnut Brass Quintet have engaged with over 300 students from schools across the city each year. In-school master classes and seminars give students the opportunity to work directly with internationally respected musicians. 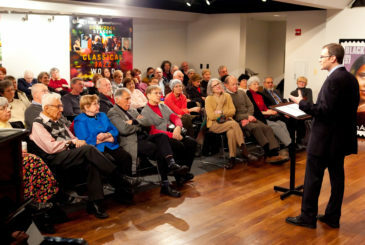 For many students, master classes are the first entry into a world of diverse ideas, offering insights into other interpretations, specifics on technique and historical and cultural context. In addition, our unlimited concert passes offer students and young friends the opportunity to attend frequently and teachers are welcome to bring students to concerts and open rehearsals for free. Please contact Erik Petersons, Education and Outreach Director, at [email protected] for more information. Pre-concert lectures led by respected musical scholars and composers provide valuable insight and perspective on the music for our audience at 25 concerts each season. These relationships with leading authorities in the field of chamber music bring a depth to our programming that goes beyond program notes.